[3dem] FEI LowDose over-exposing film? Previous message: [3dem] FEI LowDose over-exposing film? Next message: [3dem] FEI LowDose over-exposing film? My apologies, I didn't read John's contribution to this thread. The notches aren't going to help if Kodak put them on the wrong side! Subject: Re: [3dem] FEI LowDose over-exposing film? The way that we check for this problem is by the curvature of the film -- the side with the emulsion is slightly concave, so if you find films where the curvature is wrong-way-round (that is, convex with the notch in the upper right corner), throw them out before putting them into the cassette. John Rubinstein brought up an issue that had not crossed our minds - as it turns out, some (but not all) of the films in our batches of SO-163 have the emulsion on the WRONG side relative to the notch. With the emulsion side down, the backscattered electrons from the metal film holders are resulting in this over-exposed appearance. We are using film purchased from Ted Pella in late 2010/early 2011. If anyone else has noticed this issue and remembers what batches of film had this problem, please let me know. One way is to try scratching off the emulsion with a razor after it's been developed. It should scratch off easily and be clear underneath if you are scratching the emulsion side. The other way (this is how we plan on checking that each film is emulsion side up when loading plates in the future) is to gently slide a gloved finger along a corner of the film. The plastic side will squeak, while the emulsion side does not. We are encountering a serious issue collecting film using our Titan (not Krios) with the Tecnai low dose kit. Certain images appear to be severely over-exposed, while others appear to be normal, high quality, low-dose exposures. Here are two examples of images collected during the same session, from the same cartridge of film, one right after another. 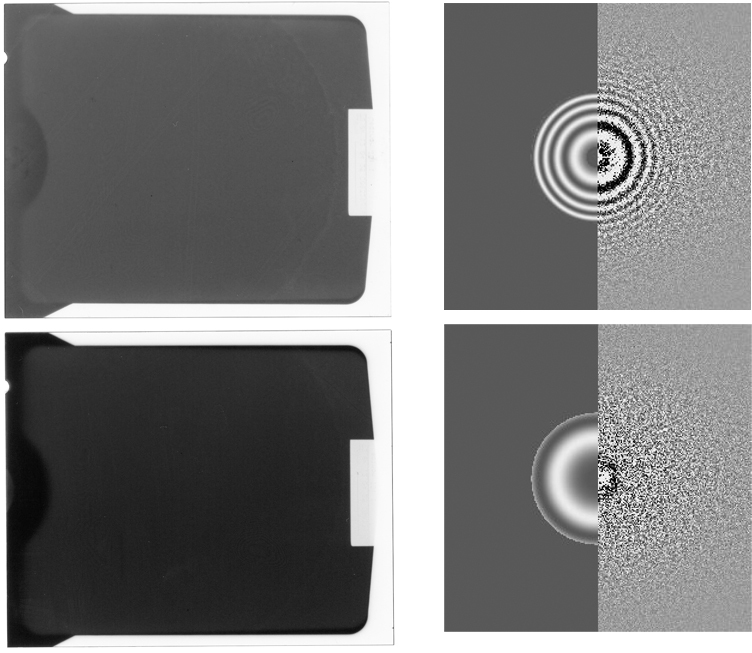 The top image is of good quality, exhibits Thon rings to around 5Å, while the one below it has no discernible Thon rings, and is overall much darker in appearance. We can only assume that this is due to overexposure of the film to the beam, but not to the extent that we see obvious radiation damage to the sample (no bubbling). We've monitored the blanker during the exposures, and according to all the readouts in the Tecnai software it is working properly. The film is inserted into the microscope and waits for 10 seconds before exposing the film. Multiple users are having this issue. Also, we never seem to have this problem when collecting CCD images. If anyone has ever experienced this issue or has any insights into what is happening, we would be most appreciative.